Servius Sulpicius Galba Caesar Augustus was Roman Emperor for seven months from 68 to 69. 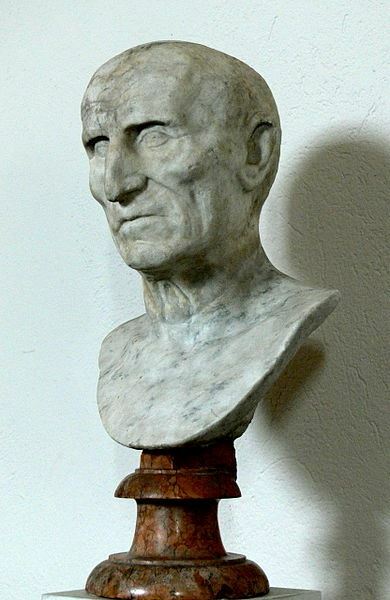 Galba's primary concern during his brief reign was restoring state finances, and to this end he undertook a number of unpopular measures, the most dangerous was his refusal to pay the praetorians the reward promised in his name; Galba scorned the notion that soldiers should be "bribed" for their loyalty. In January 69, two rival emperors were declared; Vitellius in Germania Inferior and Otho i Hispania. Following this, he was met by a troop of Otho's cavalry and killed near Lacus Curtius. According to Plutarch, during Galba's last moments he offered his neck, and said, "Strike, if it be for the good of the Romans!"